James Tracy was born in the art colony of Nashville, Indiana in nineteen fifty. His exposure to the art of T.C. Steele, Gustav Baumann, Glenn Cooper Henshaw, and other local masters led to an early awakening of his natural artistic talent. He began formal training at eight years of age, studying with area artists. Tracy later attended The University of New Mexico and Indiana University. 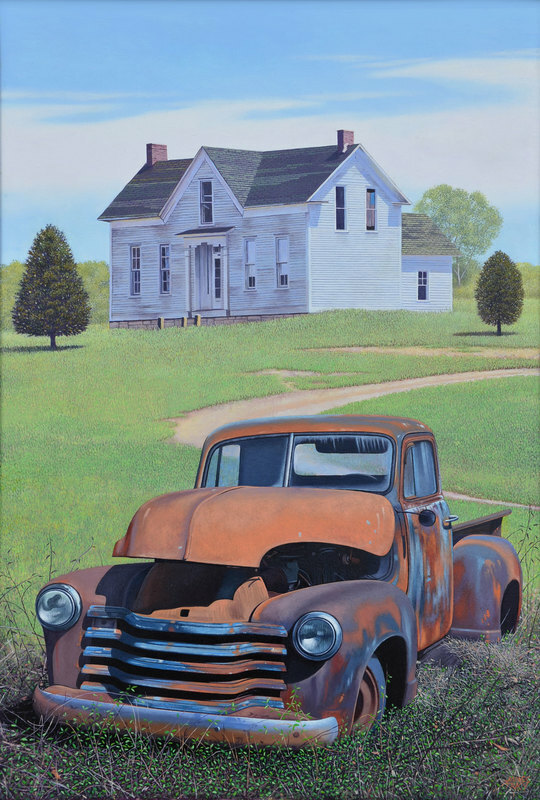 Since embarking on his professional career over thirty years ago Tracy has explored most drawing and painting media, specializing in oil paintings of rural landscape, still life, and portraiture. Since 1990 he has also been involved in printmaking, creating woodcuts and linocuts. He has won awards in many prestigious exhibitions including The Hoosier Salon, Indiana Heritage Arts Exhibitions, and The National Juried Exhibition for Painting and Sculpture at The Salmagundi Club in New York City. In 2001 Tracy was distinguished as one of the artists featured in 75 Miles In Any Direction, an exhibition of contemporary Indiana art at the Indianapolis Museum of Art Columbus Gallery. His work is included in many private and corporate collections throughout the United States and abroad. Mr. Tracy was chosen in 2002 for inclusion in the Marquis Who's Who In America for his contributions to the arts. He is represented by the Brown County Art Gallery Association in Nashville, Indiana and The Hoosier Artist Gallery in Nashville, Indiana. "Looking back on over 40 years of making art, I can trace the evolution of what I do now to the many different materials, techniques, subjects, and styles I've experimented with. In my youth I began making drawings and small paintings of the people and environment around me, the things I knew. Nature was my first and foremost teacher, and I would wander the woods, creek valleys, and farm fields for hours at a time when I was young, soaking up the light and textures, and spiritual essence of the natural world. This was and continues to be my prime inspiration. After I began formal art instruction I began to experiment with surrealism and abstractions. In the 1960's I began to be influenced by Dali, Jasper Johns, Richard Linder, Frank Stella, Rosenquist, Rauschenburg, and other New York artists; and then Warhol, Pop Art, and the Photorealists. Throughout my career I have also been inspired by Andrew Wyeth. 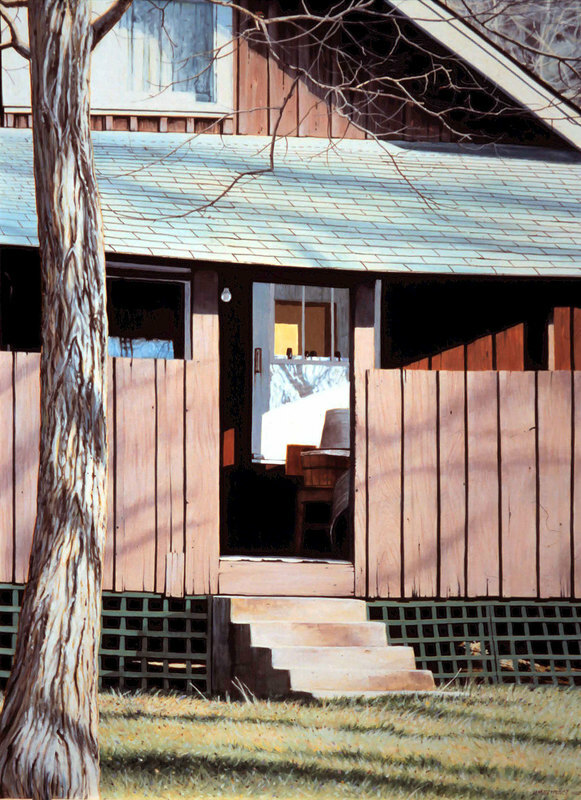 These investigations, and my love of nature came together in the 1970's and early 1980's as a style typified by realistic scenes and objects, often rendered in a hyper-realistic fashion, juxtaposed in what I would term "imagined realities". These experiments lead me to rural and urban scenes, landscapes, still lifes, and portraits painted in a highly detailed realistic style; which I've been exploring for the past 20 years. 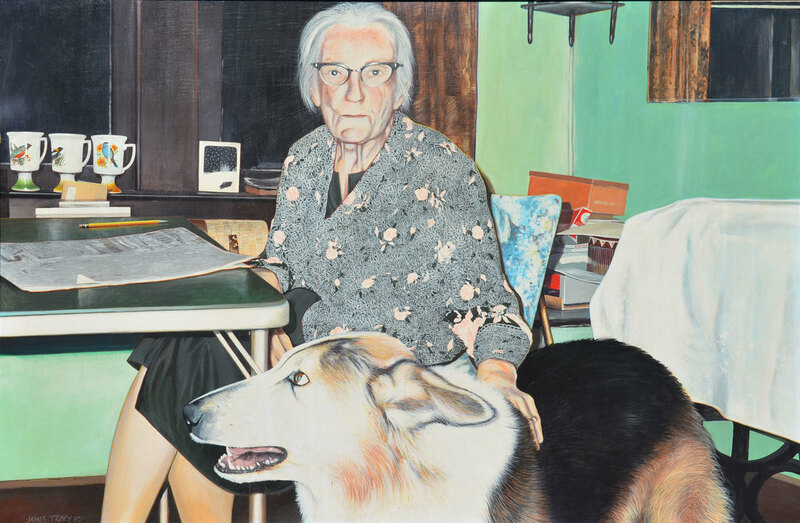 The Woodsman's House, oil on panel , 12" x 32"
Thunderbird, oil on panel, 18" x 36"
Old Paint, oil on panel, 24" x 36"
Blanche and Omar, oil on panel, 36" x 48"
Back Porch, oil on panel, 36" x 48"